As I mentioned in my previous entry, I’m fortunate that I have a very good working relationship with my boss and colleagues and enjoy my job and the company at which I work. Because of the twists of circumstance surrounding my move to Thailand more than five years ago, my current manager was my subordinate’s subordinate before I moved. For my trip to Los Angeles, she and another of my colleagues traveled out to meet me for two and a half days of meetings. 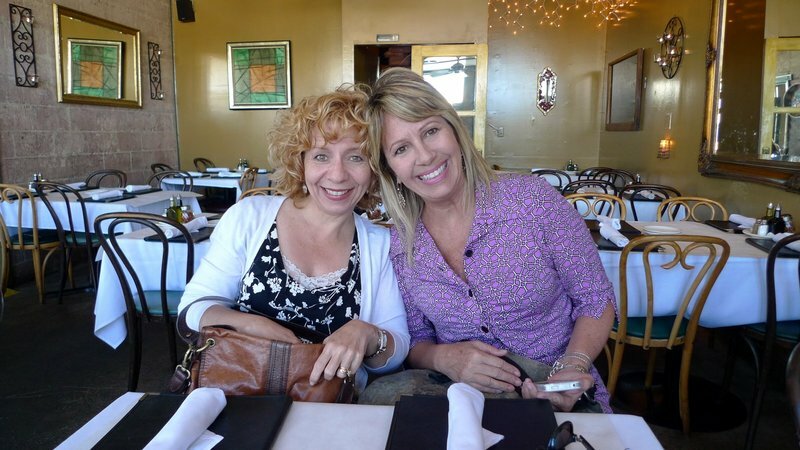 One evening we dined at an Italian restaurant in Hermosa Beach called Buona Vita. 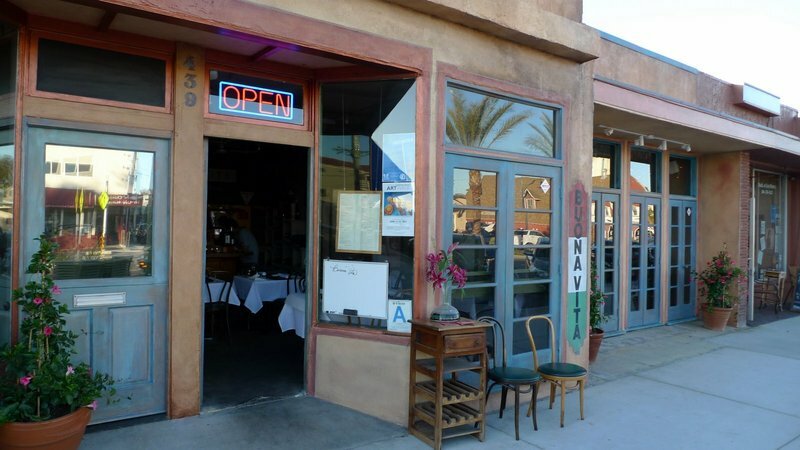 Buona Vita is on Pier Avenue, the main thoroughfare in Hermosa Beach. I first went here back in 1995-6, when I lived in LA for my second time. A colleague, who was of Italian heritage, loved going here because the food reminded her of her grandmother’s cooking. There are actually two dining rooms, located about four doors apart. 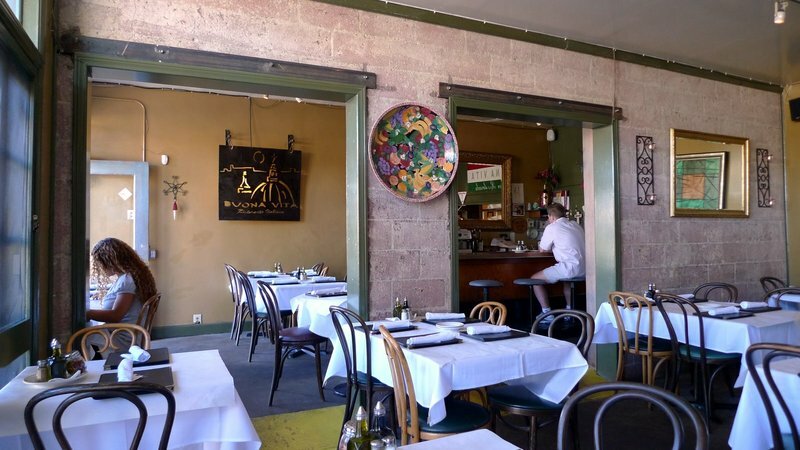 One is the trattoria, pictured above, and the other is the pizzeria. My recollection, though, is that you can order the same menu items at both restaurants. 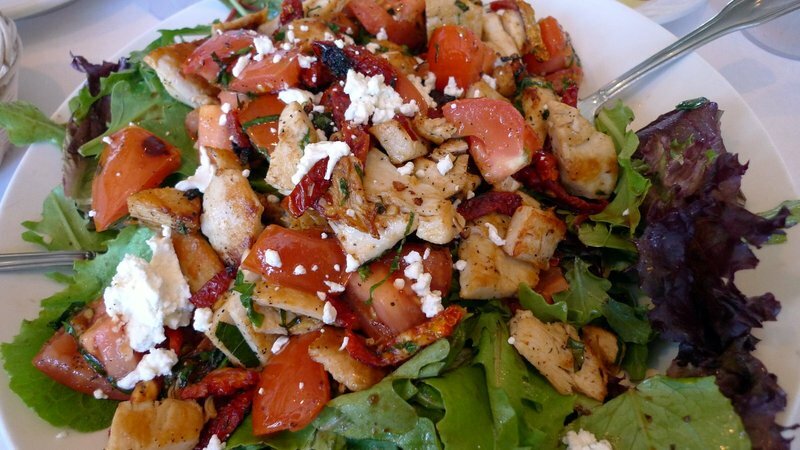 We started by sharing the Insalate di Pollo e Formaggio di Capra, mixed greens served with chicken, tomatoes, sundried tomatoes, basil, and goat cheese. I remember this salad from my visits more than a decade ago and it is every bit as good today. In fact, with a little bread, two people could share this salad and have a perfectly healthy meal. Our main courses looked a little more “American Italian”. 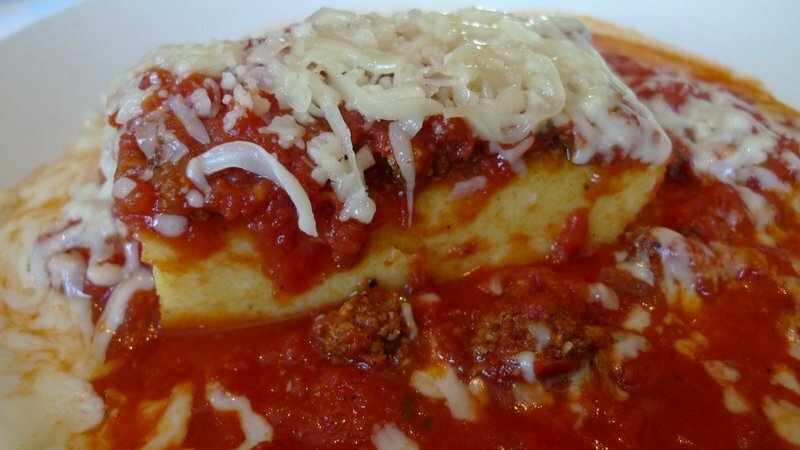 I had Polenta Bolognese – grilled polenta (a cornmeal cake) with meat sauce and melted mozzarella. 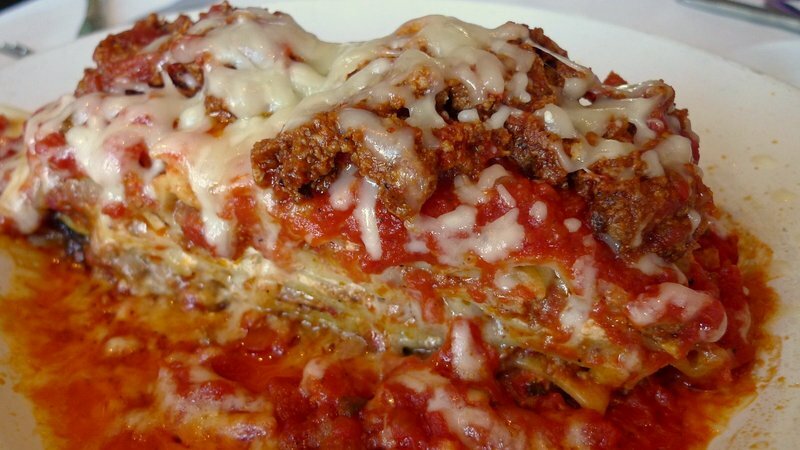 My manager enjoyed Lasagna Di Carne – a meat lasagna with Bolognese sauce and ricotta and mozzarella cheeses. Both these dishes were very good but even before digging in we cut the portions, placing about two-thirds in a two-go box and eating only a third. Portion sizes were too large. 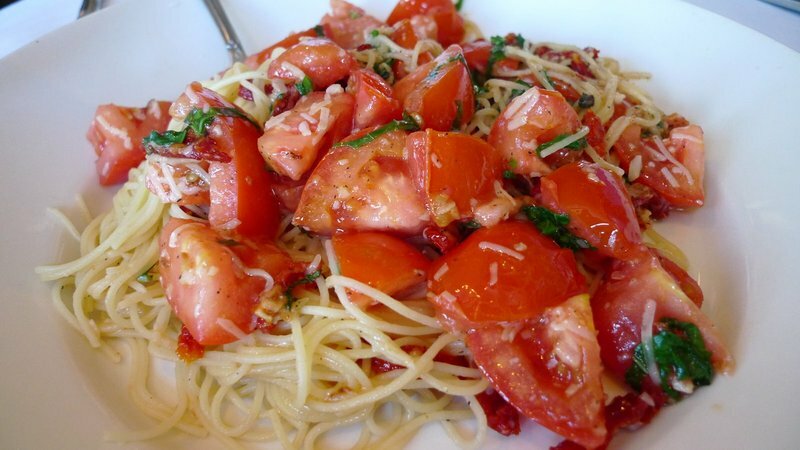 My colleague had Spaghettini Alla Checca – thin spaghetti noodles, fresh tomatoes, sundried tomatoes, dressed in basil and olive oil. Portion size was more reasonable and it was overall lighter in composition. For dessert we tried two things. The first was the tiramisu. This seems very different at each restaurant. I like that this version was less gloppy. The espresso and liquer mixture was much lighter and the dessert didn’t taste boozy. I had the cheesecake which was fine but uninspiring. The whipped topping doesn’t taste like cream. I might be wrong, but it tasted more like whipped “topping” rather than whipped cream. And here is my colleague and my manager. All in all, the meal was very enjoyable and food and service were good. The pasta dishes are a bit heavy and portion size is large, but the salad was certainly a hit. This entry was posted in Uncategorized and tagged Angeles, Beach, Buona, cuisine, Dining, food, Hermosa, Italian, LA, Los, Los Angeles, Restaurant, Trattoria, Vita by christao408. Bookmark the permalink. Thats my favorite food. My mouth just watered at the looks of things. What happen to the wine pictures ? Please don’t tell me you had water ? i loved the Spaghettini Alla Checca! =) as always, great pictures Chris! @The_Eyes_Of_A_Painter – Did have a glass of wine, but it seems that a glass of wine is a glass of wine, nothing particularly interesting to take pictures of. Same reason I didn’t post a picture of their bread basket! @ThePrince – Glad you enjoyed. If I were to order again, that would have been my choice, too. I am not much for dessert after such a meal. I feel the portions could be for a second meal that day or certainly my supper the next day. Italian food! I love it. The salad looks very good. Those are large portions. I think I would just fall asleep if I finished the lasagne. 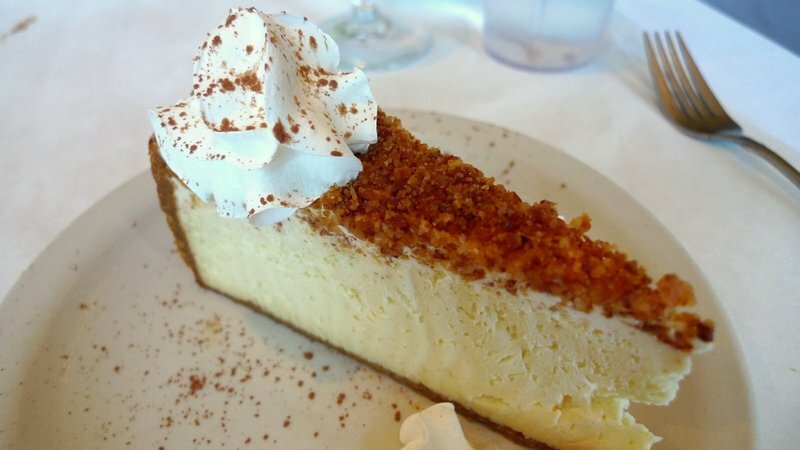 Good cheese cake is hard to find – but the hunt is worth it! Sorry this one wasn’t all you had hoped. Your colleague and manager look so young. Glad they were able to come down and meet with you. 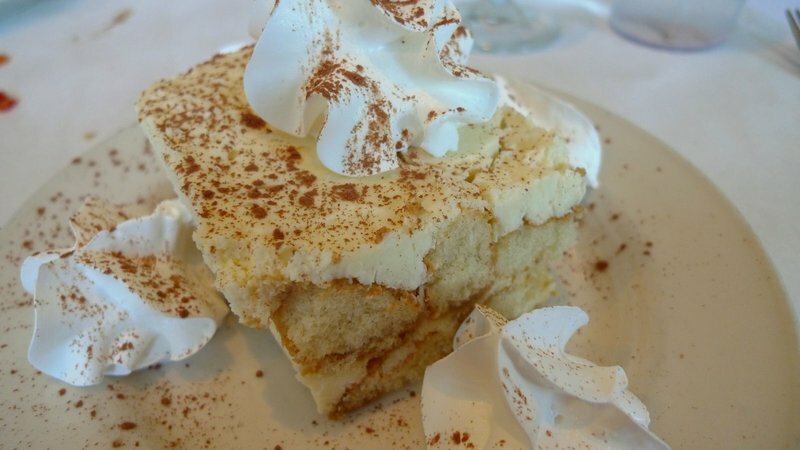 I love the picture of Tiramisu. I would have probably had that. @ZSA_MD – We all try to maintain a young vibe! I’m sure they’ll be happy to hear your comment. @murisopsis – That’s true, there are no shortage of cheesecakes but very few are really GOOD. @ElusiveWords – I didn’t recall their portions being so large, but maybe living abroad I’ve just learned to expect smaller portions. @icepearlz – The salad was the highlight. @lcfu – Carnivore! LOL@Fatcat723 – There is definitely not a lot of room for dessert after a meal like that. That’s one reason we divided the entrees from the start, setting aside the majority of the food to take home. Save room for dessert! =D@yang1815 – Not “great”, per se, but tasty. It all looks yummy! Large portions are hugely common here — I almost always take home half the food served, particularly from Italian restaurants.